Quick Definition: Supply-side economics is a subfield of economics that argues the supply in the economy is what determines long run economic growth. 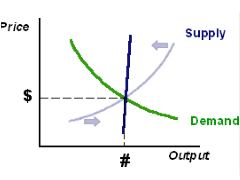 Supply-side economics is the name of the branch of economics that argues economic growth (often measured by gross domestic product (GDP)) is largely dependant on the aggregate supply in the economy rather than the aggregate demand. Many economists believe that the amount of goods and services produced in an economy in the short-term is mostly down to the amount of aggregate demand in the economy i.e. the demand-side. However, a recent group of economists have argued that it is the supply-side of the economy that mostly determines short-term and long-term economic growth. Supply-side economists believe that the government should be basing their economic policies on increasing the aggregate supply in the economy rather than just the aggregate demand. These policies are called supply-side policies. Lowering corporation taxes in order to encourage business investment. Deregulating markets or ‘cutting red tape’ in order to cut the costs of doing business. Investing in infrastructure such as roads and railways in order to improve the productivity of the economy. Spending money on the training of workers in order to increase their job prospects. Aggregate supply – This refers to the total supply of goods and services in an economy.